Elizabeth Ride has sent these BAAG reports including the map about Hip Tung Wo Engineering Works. Thanks to Mark Regan for retyping the reports out – some of which are barely legible as can be seen with the first one. There appears to be very little information about what was obviously a sizeable company during the Japanese occupation of Hong Kong during WW2. 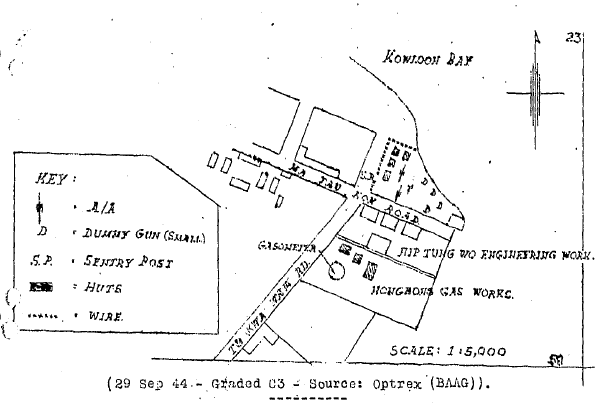 The BAAG map below, from 29th September 1944, shows the location of the works at the Kowloon Bay side of the junction of Ma Tau Kok Road and To Kwa Wan Road. 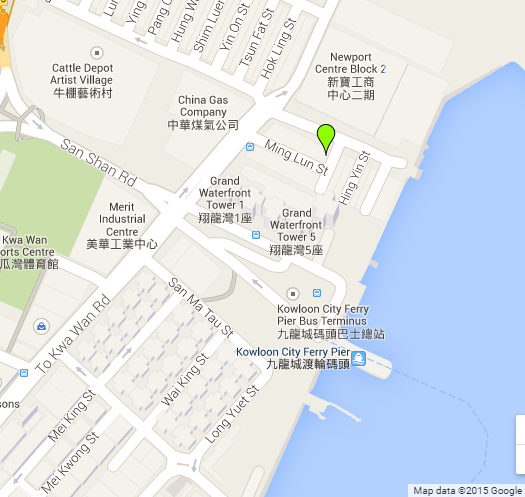 The road separating it from the Hongkong Gas Works is Ming Lun Street as shown on the contemporary map below. Compared to much of Kowloon, the waterfront doesn’t appear to have changed that much since WW2 with the addition of only three short streets running parallel to the harbour. However the area north of Ma Tau Kok Road has been reclaimed the first building being the Newport Centre. Interestingly, the site across To Kwa Wan Road is now a Towngas storage facility. About 150 workers. Builds engines for the Fukui Shipyard at Ngau Chi Wan, Kowloon Docks and Bailey’s Shipyard for use in wooden auxiliary vessels – has own power plant thus work was not affected by the power restriction order. Output is efficient. Works have just received orders from the Governor’s Dept. for building 100 15 H.P. engines for river craft. 3. Smelting. The Japs are smelting copper, brass, steel and iron scrap, and making armour (?) plates and iron plates for shipbuilding in the Hip Tung Wo Factory in To Kwa Wan. (1) Hip Tung Wo Engineering Works (22705912) This factory is mainly engaged in buiding 115 h.p. diesel engines for auxiliary vessels. It generates its own supply of electricity. Workers number over 300. There is at present a shortage of cast iron, iron plates, paint, etc. Engineering Works: The Hip Tung Wo Engineering Works (22653823) has its own electricity supply from a diesel engine. Production is 12 13-H.P. diesel engines daily. (3) Engineering Works (227591): The Hip Tung Wo Machine Works is engaged in the construction of diesel engines. 2,000 Chinese are employed, and working hours are from 0700 to 1200 hrs and 1300 to 1800 hrs. Ships’ engines are also stored here. Stephen Davies: I have a strong feeling that Hip Tung Wo may have been involved in the building of German design diesel engines under Japanese supervision at Taikoo Dockyard, three of which after the war were acquired by Mr Fu Tak-iong, who had got in on Macao gambling pre-war. This article was first posted on 27th January 2015.